When it comes to social media, are we doing enough at our company to keep up? 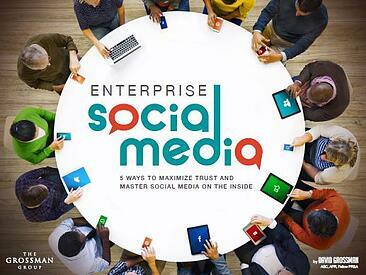 Enterprise Social Media: 5 Ways to Maximize Trust and Master Social Media on the Inside, offers lessons on deploying Enterprise Social Media (ESM) in ways that resonate with employees and leaders alike. Social Media Is Not a Magic Bullet: It can’t create dialogue & engagement out of thin air. Be Curators and Docents: You must have a hand in assembling shareable content & become guides and interpreters of it. Yes Virginia, There Is an ROI: Companies that put a premium on ESM conversations have a higher likelihood of turning employees into brand ambassadors. Hockey Pucks and Subways: Communicators need to anticipate where their key stakeholders are headed, not where they’ve been. Leadership (Still) Matters Most: Online tools alone can never bridge any pre-existing gaps in leadership communications and outreach. Download—Enterprise Social Media: 5 Ways to Maximize Trust and Master Social Media on the Inside—by filling out the form to the right and set your company up for sustainable online success.